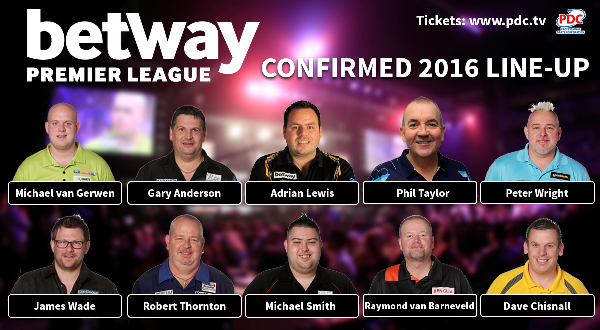 MICHAEL SMITH will make his Betway Premier League debut in 2016 and Robert Thornton returns to the ten-player field for the biggest-ever season in the tournament's history. Former World Youth Champion Smith sees his rise to eighth in the world rankings, alongside his runs to the Grand Slam of Darts semi-finals and World Championship quarter-finals, rewarded with a coveted place in the £700,000 event. Reigning champion Gary Anderson, who defeated Michael van Gerwen in the 2015 final at The O2 in London, will join his Dutch rival, Adrian Lewis and six-time Premier League champion Phil Taylor as the four automatic selections for the event. The ever-popular Raymond van Barneveld, the 2014 Premier League champion and a World Championship semi-finalist this week, is joined by 2015 Premier League semi-finalist Dave Chisnall as Sky Sports Wildcard selections. Robert Thornton's victory in the World Grand Prix last October sees him return to the Premier League, having previously competed in the tournament in 2013 and 2014. Former Premier League champion James Wade and flamboyant former World Championship and UK Open finalist Peter Wright complete the ten-player field, with the season set to begin on Thursday February 4 at the First Direct Arena in Leeds. Play continues across the opening nine weeks before the bottom two players are eliminated following Week Nine's Judgement Night. The remaining eight players face off once more in the battle for Play-Off places, with Rotterdam's Ahoy Arena set to stage a league night for the first time before the semi-finals and final take place at The O2 in London on Thursday May 19.